Over the last few weeks, we have been announcing the latest features that iMindMap 10 will offer. So far we’ve revealed brand-new Branch Drawing Tools, in-line access to thousands of Mind Map templates, plus exciting new updates to Fast Capture and Brainstorm View. Today we have even more to share with you as we introduce our new system for categorising information, with the new Tags and Icon Manager. These updates offer a way of categorising and ordering your Mind Map, Fast Capture and Brainstorm View creations in a way that’s personal to you. Team members, to denote who’s working on a task. Topic, to indicate what will be covered within a curriculum plan. Performance metrics, to measure personal goal progress. The possibilities are endless. Assign Tags to branches, sticky notes and idea bubbles. Create Categories to gather your Tags into specific themes based on the purpose of your project. Categories help you differentiate between your Tags, making them easier to find. A powerful filtering system will put your Tags to work. Quickly find the information you need by filtering your project using the Tags of your choice. Filters help you get the most out of your workspace by only displaying the information you need at that moment to get things done. The versatile nature of Tags means they can be used across a variety of projects, whether they are work or personal. Tags sit discreetly in your projects so your workspace remains clutter free and easy to follow. If you’re looking to visually categorise your projects, find iMindMap 10’s new Icon Manager in the refreshed Side Panel. Just like Tags, you can import your own icons and build up a library that is totally unique to you and the way you work. Adding icons to your workspace, whether that be Mind Map, Brainstorm or Fast Capture View, allows you to find information and see related elements at a quick glance. Plus, you can filter your project by icon for when you need to focus on something specific. 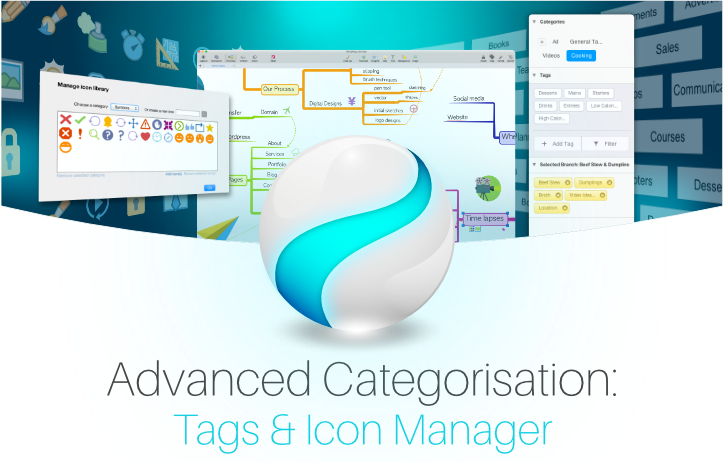 Use iMindMap 10’s Tags and Icon Manager to create a personalised classification system. We know that accessing the right information quickly is vital for your productivity levels, and have included these latest updates to help you do just that. iMindMap 10 allows you to bring your projects to life with audio and video. Play a wide range of multimedia files within your project’s workspace, and add an extra element of interest when presenting your ideas to others. iMindMap 10 can recognise multimedia weblinks such as .mp3, .avi, or YouTube links as they are dropped into your workspace. Videos now play in a pop up window, meaning you can view them within the project you’re currently working on or while presenting to others. iMindMap 10’s Side Panel has been simplified and condensed for quicker access to the tools you need most. Icons and images have now merged*, meaning you can find all your visual elements in one place. Notes and links have also been grouped together in the Attachments* library. iMindMap 10’s Side Panel includes a brand-new format* tab, which can also be accessed via your Pop Up Edit Menu in Mind Map View. The format tab places all your favourite customisation tools at your fingertips, speeding up the creation of unique and personalised projects. * Update for Windows only. These updates to iMindMap 10 have been put in place to refine and speed up your workflow. These additional features and improvements help you create engaging projects that will keep your focus sharp and your motivation high.